Prav, one of my favourite juniors during my anesthesia days. We hit it off from the time we met, progressing from junior to a friend. Pre anesthetic rounds and managing OT cases with her were fun and would be over in a jiffy as she picked up things very quickly. It came as a shocker when I got to know she was diagnosed with Hodgkins lymphoma in her final year MD. 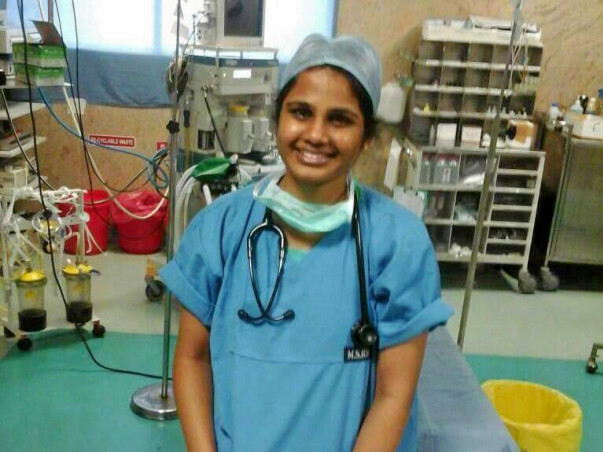 A bubbly, young, talented anesthetist in the making..her world had suddenly come to a standstill. A small lymph node which she had casually got tested, turned positive for lymphoma! She had started her life recently, married to the love of her life, career on full swing, and had thebest of friends she could ask for.. suddenly life had thrown the toughest challenge at her. But the way she handled the whole situation was amazing. Though she looked a lot different,she still had the same charming smile. She covered her head with a veil so that nobody noticed her hair fall, but I could not, not notice her zest for life. Though her hands were swollen and painful because of side effects of the chemo, her eyes always had that twinkle. 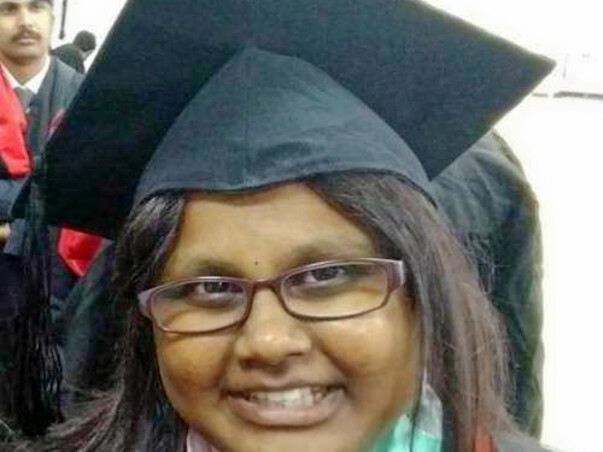 Her body felt weak most of the time, but she had the courage to sit with her friends and study for exams. For she was a fighter, who did not believe in running away from problems..she stood there like a rock... It was no surprise for me when she cleared her exams. The story is not yet done - This strong girl fought cancer and emerged survivor…but it seems, God is not done testing her. Her ordeal continues... the cancer sneaks in again.. this time a little more stronger, more stubborn..refuses to respond to any chemo. But she is still fighting it, with her will power, determination and that same charming smile. From exhausting all the chemo agents and innumerable cycles, multiple hospital admissions, to being the spirited doctor who sits on the stairs waiting for her consultation amidst other patients, and empathizing with people suffering more than her..Prav is the epitome of strength. Needless to say, her treatment has been expensive and her family has been able to pull up their finances to pay bills until now. 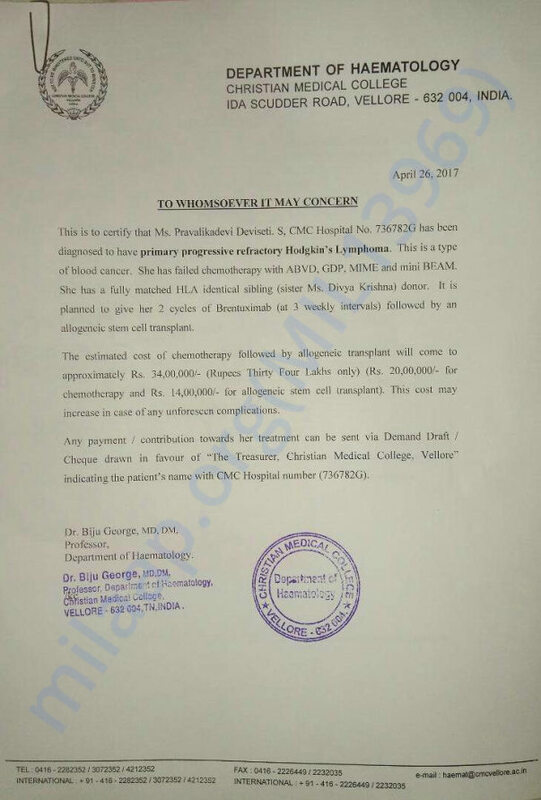 She has now been offered Brentuximab which is an expensive drug costing around 9 lakhs INR per cycle. 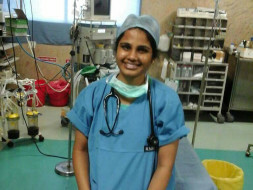 She has been advised 2 cycles of Brentex followed by stem cell transplant which will cost around 15 lakhs more. The insurance will not cover her charges as the drugs are monoclonal antibodies and the stem cell transplant is not approved under her policy. We..her friends , urge you to come forward and help her in the battle she is fighting so bravely. The Brentux has been shown to offer good results in people with relapsed disease and we are really really desperate and hopeful at the same time. Please help us to help Prav - a braveheart, an inspiration. This is Pravallika. Hope all of you are doing well. Not just hope, I want all of you to be happy, proud of your timely care and benevolence which saved a life, who is joyful and gratified to write this note today. I am doing good. My recent PET scan is normal (No evidence of disease). The doctor said to continue few antibiotics and to come for follow up 3 months later. Rest all is fine. Even I am trying to get back to routines as soon as possible. All of you are amazing in one or the other way. I will forever remember your help/service/guidance and reciprocate it to others who are in need. I wish one day I could meet YOU personally to tell you how much I am indebted to you and how great you are!!! Pravallika been showing steady improvement post transplant. Her nausea and vomiting have reduced (though occasional vomitings are happening due to the medications she is taking post transplant). Her appetite has improved and is able to eat better. She started less intense activities like walking to gain her physical strength. PET CT scan was done in mid November and the report has come negative indicating the disease in control. But since she being a high risk case, doctors have suggested Donor Lymphocyte Infusion(DLI) to reduce the risk of disease recurrence. DLI might induce GVHD(Graft vs Host Disease) where donor cells fight against the receipient body which also helps in disease control. 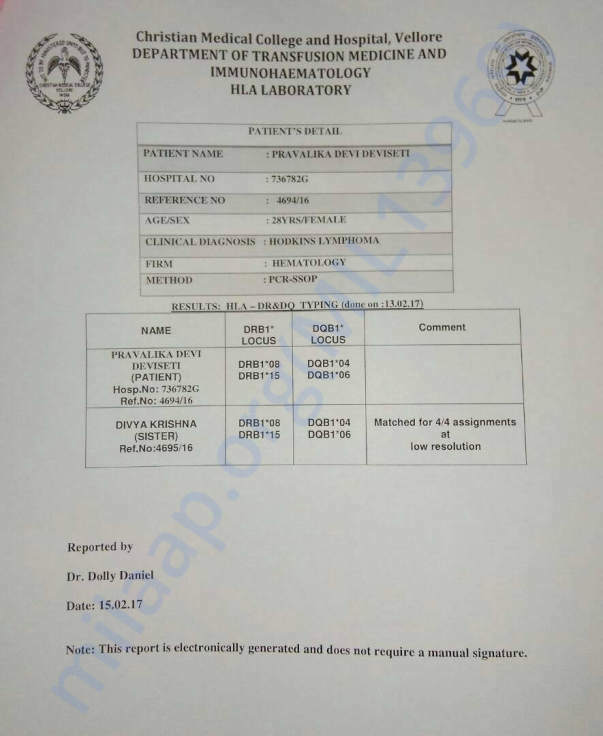 DLI procedure is planned in 3rd week of December, its a one day procedure where lymphocyte cells will be extracted from her sister Divya and are infused on the same day to Pravallika. We are hoping that the procedure goes smooth and helps to control the disease further.GVHD side effects like vomitings, diarrohea are expected post transfusion. We would like to thank you all again for the good wishes and support you are giving for Pravallika. Pravallika been showing steady improvement post transplant. Biopsy report has come negative for GVHD(Graft vs Host Disease). Though nausea and vomiting have reduced, she is still having occasional vomitings due to the medications she is taking post transplant. Her appetite has improved and is able to eat food though in little quantities. Though her WBC and platelets counts are stable there is higher risk of infections in the initial 3 months till an year post transplant due to the Immunosuppression drugs that she has to take to prevent GVHD. So weekly follow up and blood tests are being done to monitor the WBC Counts and the overall response to the transplant. Considering the complications post Brentux, she tolerated fairly the chemo induced side effects and post transplant complications. We are hoping she will improve and be back to her earlier strength very soon. We thank again for the huge support you given us without which this would not have been possible.